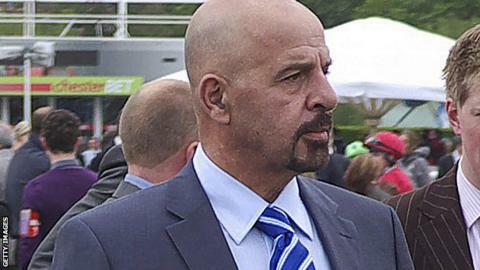 Millionaire racehorse owner Dr Marwan Koukash hopes to complete his takeover of Salford City Reds by Monday. Koukash has held talks with the Rugby Football League, as well as Salford City Council and Peel Holdings, the co-owners of the Salford City Stadium. "I hope it can be done in a few hours, certainly no longer than a few days. Hopefully by Monday we can announce the deal," Koukash said. The Kuwait-born businessman has lived in Liverpool for more than 30 years and has almost 100 horses in training. Dr Koukash spoke of his ambitions after watching Salford lose 34-16 to Wigan on Thursday in a pre-season friendly at Barton. He told BBC Radio Manchester: "I'm not doing this for financial gains because it's going to cost me money. The opportunity of lifting a trophy with the Reds is what will drive me on. "I love sport, I love being a winner and I think this is an ideal opportunity to turn around a struggling team to a championship-winning team." And he confirmed that current chairman John Wilkinson will be offered the role of president, adding: "People kept telling me how nice John is. When I met him, he was nicer than nice. He will be involved in the club as president for life." Dr Koukash promised head coach Phil Veivers his job is safe, with funds for players to be made available, as Wigan and New Zealand coach Graham Lowe is set to oversee player recruitment. Of the takeover, Veivers said: "Having someone like Marwan behind us is immense. "It gives me the staff that I require to do a job - that's number one on the agenda. Number two on the agenda is that it gives me a team that can compete with anyone in the competition." The Reds are thought to be around £600,000 in debt, owing Revenue & Customs around £300,000, plus a combined total of around £70,000 to former players Luke Patten and Vinnie Anderson in unpaid wages. And it was the prospect of new investment that persuaded a judge to postpone the hearing on 7 January - which was - for another four weeks. Salford begin the Super League season on 1 February with a home fixture against Wigan - three days before the rescheduled hearing.